Start by updating any anti-virus or personal firewall software that may be installed on your computer. For 3rd party software (ZoneAlarm, Norton AntiVirus/Internet Security, Mcafee, Avast, etc) check with the appropriate software vendor for details on updating the software and definitions. You also need to consider the Windows Firewall (accessed via the Control Panel as seen below) which may block the game from accessing the Internet. Please note that to update your Windows Firewall definitions you will need to keep your Windows Updates up to date. If updating these programs does not resolve the issue, you may need to configure the software to allow access to the specific application. This is generally done through the exceptions list (may be named differently depending on your software). When adding the game as an exception remember to add the executable (exe) for both the game and Uplay. You may also encounter problems due to applications running in the background on your computer system. If you are encountering problems playing online, please try closing all running background applications before starting your game. You can find the steps for this listed below. Click Start and type MSCONFIG into the Search box and click OK. This will open the System Configuration Utility on the General tab. Click on the Startup tab, and then click the Disable All button. Click OK and then restart your system when prompted. Note: this should be seen as a temporary solution and any changes can be reverted by returning to the MSCONFIG utility and clicking Enable All on the Startup tab. On Windows 8, Windows 8.1 and Windows 10 the start-up programs can be switched off directly from the Task Manager. 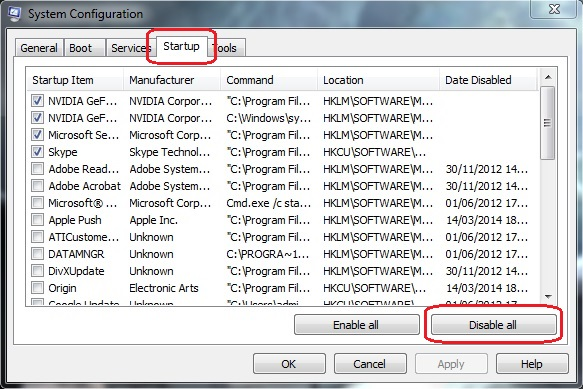 In order to disable an unnecessary program, click on it with the right mouse button, and from the context menu chose Disable. The hosts file is a small text file which is part of the Windows operating system. This can be used to route traffic or sometimes block a website. To rule this out when dealing with problems accessing the multiplayer part of the game, it should be cleaned or reset. The easiest way to clean your HOSTS file is by clicking on the Fix it button on the Microsoft article found HERE (Windows 8 users, please see the Fix it myself link).